One of America's most uncompromising novelists, Russell Banks received the Anisfield-Wolf Award in 1999 for Cloudsplitter, a book about the abolitionist John Brown. Narrated by Brown's son Owen, the novel tackles complex themes of violence and social change, while also attempting, Banks said, to "tell a domestic story, a relational story" that would "humanize" the man many whites considered a madman, and most blacks consider a hero. 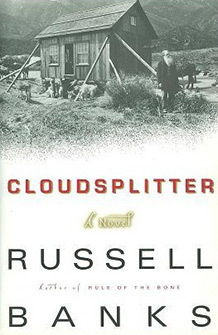 Cloudsplitter, Banks's first attempt at historical fiction, came after such critically acclaimed work as The Sweet Hereafter, Affliction, and Continental Drift– books that, despite settings ranging from hardbitten northern cities to the Jamaican countryside, share an interest in despair and the distant hope of redemption. It's a narrative that resonates with the author's biography. Raised in rural New Hampshire, Banks initially planned to follow his father into the plumbing business; where he grew up, he told an interviewer, "the idea of being a writer was like the idea of being a butterfly." But his mother intervened, helping to send him to the University of North Carolina. By the time he graduated, in 1968, Banks was publishing short fiction regularly and was able to find work teaching English and writing. For Cloudsplitter Banks left the familiar modern settings of his earlier novels to undertake deep historical research into Brown's early life, exploring the private man before he led a failed slave revolt at Harpers Ferry, Virginia and became a figure of enduring public debate. Banks described his subject as "an idealistic man, not a brute, not a sadist, not a psychopath, but something more complicated and seductive."